Fibre makes the poo softer and easier to pass. It comes from plant foods such as fruit, vegetables and grains. Make sure they have at least two servings of fruit and three or more servings of vegetables a day. A serving is what fits into the palm of your child's hand. For tips to encourage your child to eat and enjoy fruit and vegetables take a look at How to get 5+ a day every day on the 5+ a day website. Give them bran-based cereals, Weet-Bix, wholegrain cereals, or porridge. Avoid highly processed cereals such as cornflakes, rice bubbles, and cereals with added sugar. Give them wholemeal bread instead of white bread. Read the nutrition information panel on the bread packet and choose bread with at least 5 g of fibre per 100 g. Don't give children under 3 bread with large seeds like sunflower seeds. Don't give infants or young children wheat bran sprinkled over cereals or bran-rich cereals such as All‑Bran or San Bran. These may stop them absorbing important minerals such as iron and zinc. You can give 1 or 2 teaspoons of bran to children over 10, as long as they have plenty of fluids at the same time. If your child is already eating a fibre-rich diet and drinking plenty of fluids, increasing fibre intake further and having extra drinks will not usually help constipation. In this case, they will usually need medications. Children aged 1 to 4 need about 4 cups of fluid a day. Children aged 5 to 13 need 5 to 6 cups of fluid a day. If your child is very active they may need to have more fluid. Water is the best fluid. Try one glass of undiluted prune juice, apple juice or Kiwi Crush a day. Kiwi Crush is a kiwifruit drink available at most supermarkets. These juices contain a natural poo softener. They are also high in sugar, so make sure your child brushes their teeth after drinking. Limit milk to no more than two cups (500 ml) a day if they are over 18 months old. Too much milk can fill your child up and mean they are less likely to eat proper meals with food that contains plenty of fibre. Scroll down to How can I increase fibre in my child's diet? for suggestions. 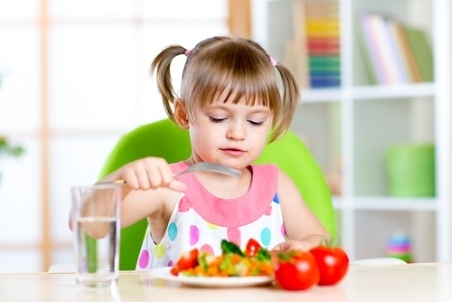 This page has general advice about healthy eating and physical activity for children.